High content screening is an image based screening technique, which measures the physical and biochemical characteristics in the cells and the organisms. The high content screening includes the software for image capturing, its evaluation and data storage. High Content Screening (HCS), which is significantly transforming global businesses and enterprises. New product launches is resulting in product assortment and thus, increased installation of High Content Screening (HCS) instruments. This is expected to bolster growth of the High Content Screening (HCS) market over. Owing to enhanced toxicity studies, demand for novel technologies in cell analysis is increasing rapidly across the globe. Instruments with enhanced cell imaging and analysis are preferred for early as well as later stages of the drug discovery process. This is expected to fuel the demand for High Content Screening (HCS) instruments in the near future. Also, increasing government support for life sciences research and increasing progress towards establishment of innovation and research-based biotechnology industries, primarily in countries such as China and India, is expected to contribute towards increased growth rate during the forecast period. The global high content screening market was valued at US$ 1,321.9 Mn in 2017 and is expected to expand at a CAGR of 5.0% over the forecast period (2018–2026). 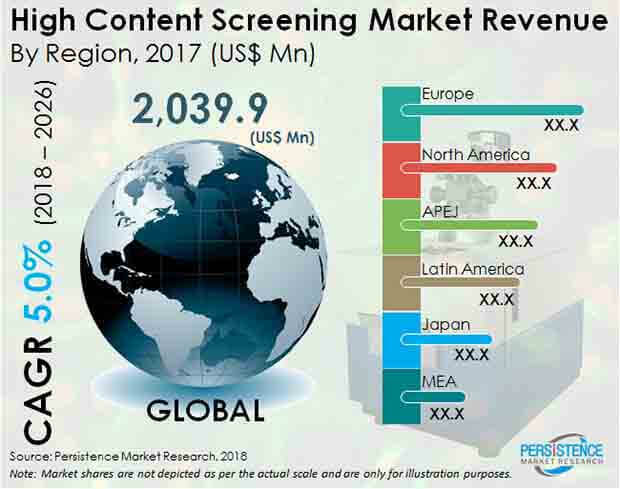 The global high content screening market has been segmented on the basis of regions into North America, Latin America, Western Europe, Eastern Europe, and Asia Pacific excluding Japan (APEJ), Japan and Middle East & Africa (MEA). In terms of revenue, North America is projected to be the dominant regional market for high content screening throughout the forecast period as manufacturers in the region are developing products that have the potential to analyze the live cells, its imaging and further target identification and validation of the drugs. Moreover the device helps in analyzing the mutations and the changes in the RNA and toxicity studies which will improve in efficiency and development of the drugs. APECJ, Japan and China are expected to witness significant growth during the forecast period as numerous research and development activities are been carried out by the manufactures to improve the cell analyzers and flow cytomeres in the high content screening market. The U.S. is expected to be the dominant market in North America due to a advancement in the technologies. The U.S., Germany, the U.K. and Australia contribute a major share in the global high content screening market.